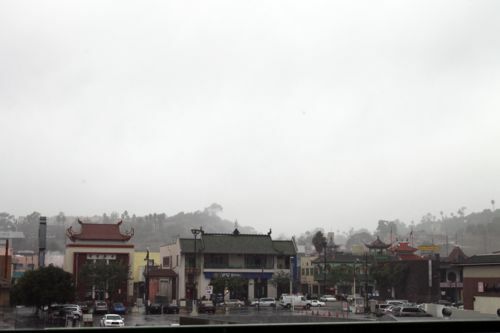 On our fifth day in California, it rained. And rained. And rained. Downtown LA isn’t the most fun or convenient place to be in the pouring rain; I think it’s fair to make that claim of any large downtown. But I had a mission that hadn’t been fulfilled yet, and this was our last day in LA. What was my mission? Trying out Los Angeles’s subway system. I am inexplicably fascinated with public transit systems (I own socks with the London Underground map on them), and I’d never tried LA’s. So I bought a far-too-expensive umbrella at Macy’s across the street from the hotel, and I hopped on at the 7th Avenue station, taking the blue and gold lines to the Chinatown station. 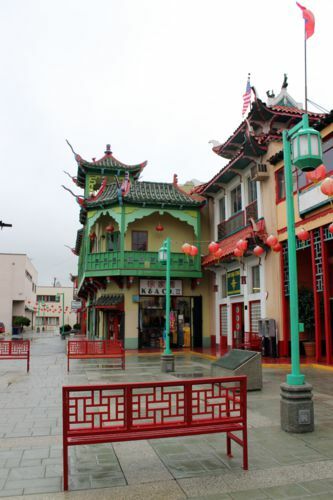 The stop is really cute with an escalator covering designed to mimic Chinatown’s architecture. 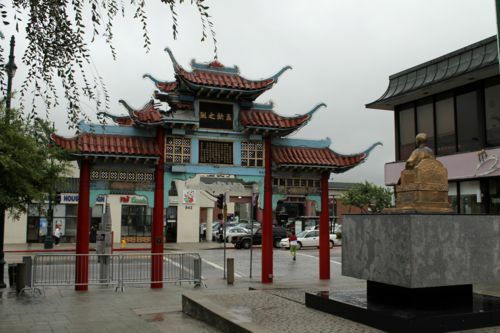 View of Chinatown from the subway stop. 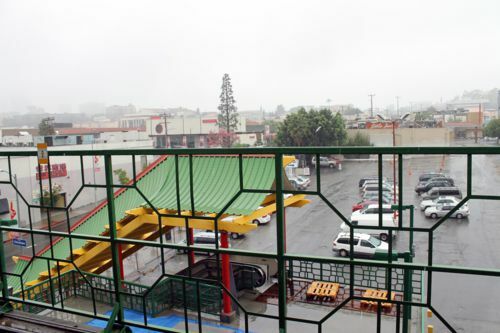 It’s only a block west toward Broadway and then a block north to the main Chinatown plaza from the stop, but in the rain, it’s not the best few blocks. 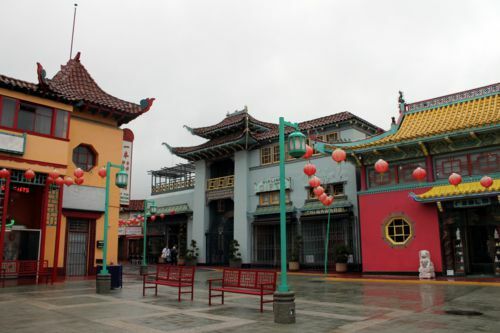 And it turns out that Chinatown is virtually abandoned in the rain—or maybe that’s just a weekday thing. It’s still pretty nifty to look at, though. 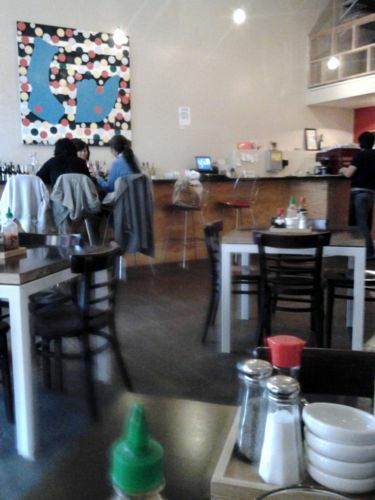 There were a couple of Chinese restaurants open with cheap prices for lunch, but the spot that looked most appealing was actually Vietnamese: the Via Café. Apologies for the blurry pictures, but I only had my cell phone to whip out here. 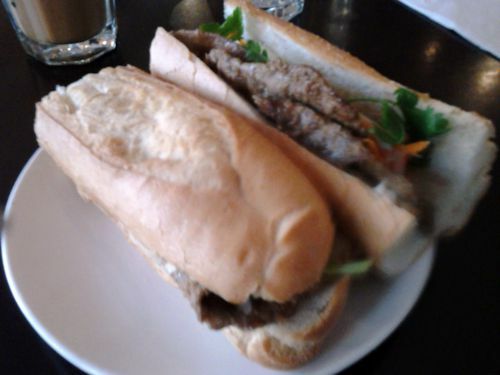 I inhaled the beef banh mi I ordered. I’ve only had a few banh mi sandwiches so far, and this one was very affordable and the largest I’ve seen. The freshness of the cilantro and carrot was welcome, but it was a bit dry compared to other banh mi sandwiches I’ve had. I also drank a Vietnamese iced coffee, and it was delicious. 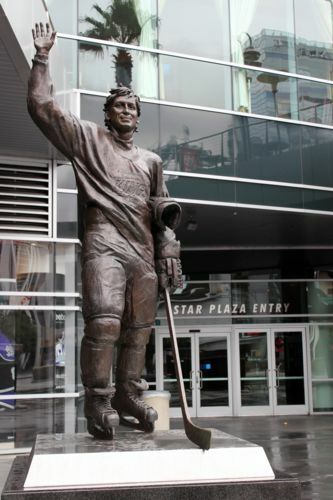 After that, I had some time to kill, and the rain was petering off, so I decided to hop back on the subway and head down to the Pico station to wander around the Staples Center and find a coffee shop. 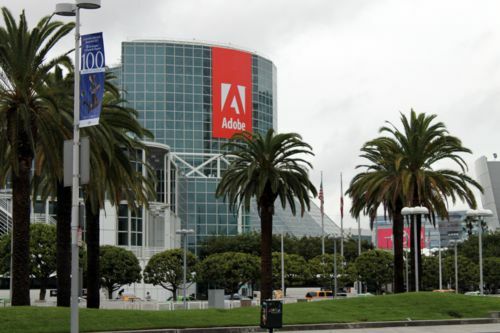 I walked past the LA Convention Center on the way and snapped a picture of Adobe Max taking over the place. 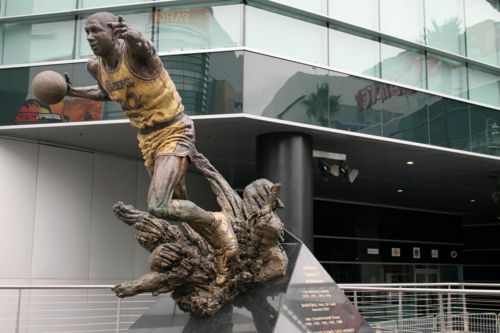 That’s where Ben was for all our time downtown, and it’s right across the street from the Staples Center. 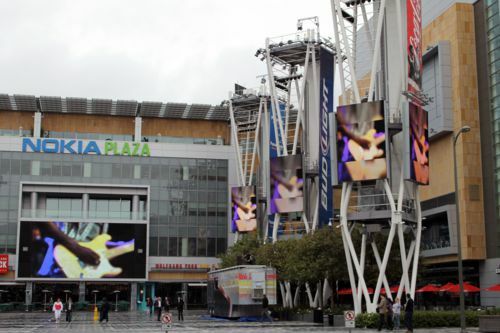 This is the second time I’ve been around the Staple Center and the LA Live! retail complex across the street, and I have to give LA props for how appealing the area is. 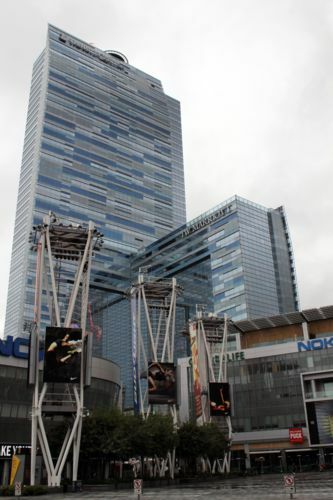 Of course, being the entertainment city, the Nokia Plaza is covered in big screen TVs, which makes for an interesting visual. 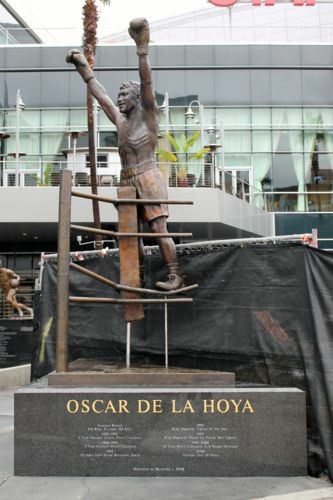 The Staples Center is dotted with fantastic bronzes of sports figures that even I—someone who remains blissfully unaware of sports at most times—could recognize. It’s no coincidence that those three gentlemen are my standard replies for any trivia question about their sports. They are basically the only names I know. Dinner was another opportunity for us to take advantage of DineLA! 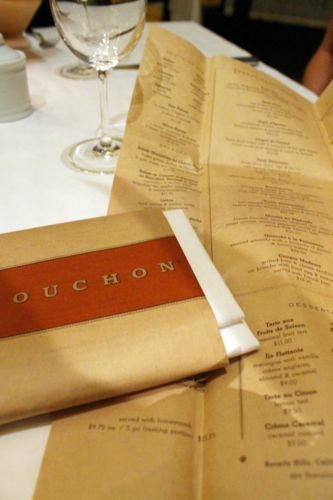 pricing, and my friend Donna suggested Bouchon in Beverly Hills, one of Thomas Keller’s restaurants. 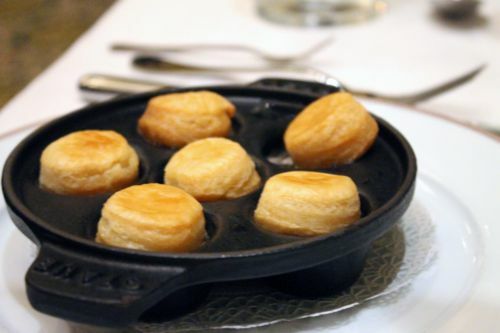 My foodie readers will know Thomas Keller as the chef and owner of the French Laundry, one of the most highly revered restaurants in the country. 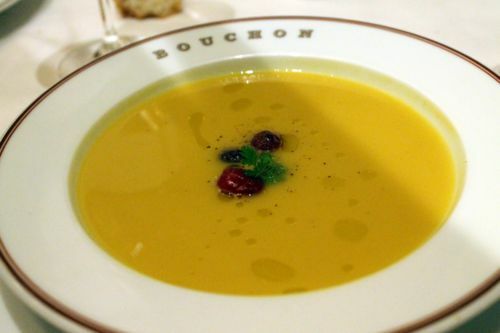 Three courses for $35 at Bouchon is definitely a steal, and spending the evening with Donna and Angela again made for a fantastic evening. First of all, the setting is lovely—you make your way past a beautiful, Spanish-style courtyard that also houses Bouchon’s bakery and the more relaxed Bar Bouchon, then you head upstairs to Bouchon proper, a large room bathed in sandy yellow walls with soft and warm pink lighting and plenty of greenery. The menu presentation was quite unique. As is often the case, I started with a cocktail. 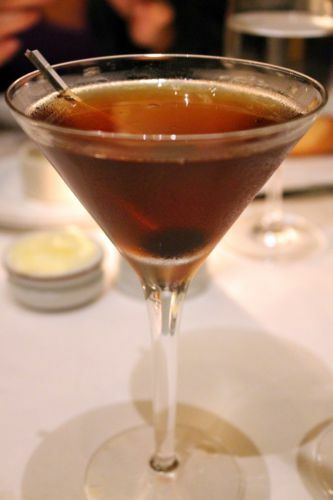 Bouchon’s list is extensive and full of classic cocktails revisited as well as their unique libations. I chose a classic cocktail I’d never heard of before, and I’m still kicking myself that I didn’t write down the name of it. It was something either nautical or related to the Queen, and bourbon, cherries, and absinthe were the primary ingredients. It was also amazing. 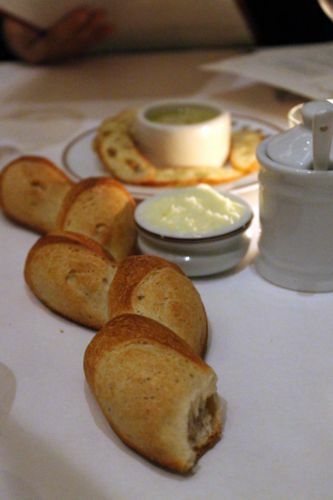 Less amazing was the return of the braided bread like we’d had at Bottega Louie. While this type of bread is fun to look at, it’s way too hard for my preferences. Those crackers you see toward the back and the white bean hummus served with them were much more appealing with a great mix of garlic to white bean flavor. For each of our courses but dessert, we essentially had one of everything. 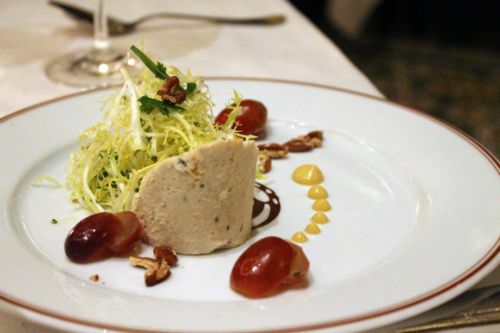 The most interesting of the appetizers were the rillettes au poulet, basically a chicken pate with preserved meyer lemon, pecans, pickled grapes, frisée salad, and sprinklings of herbs. Not only was it the most visually attractive, but the different elements reminded us of chicken salad, deconstructed. It intrigued. Ben had an escargot dish that was on special, and he enjoyed it. I didn’t try any of the cute little bites. My appetizer was the butternut squash soup with candied cranberries. It was tasty, but honestly, I’m rather bored of butternut squash soups, and this one did nothing to dispel that. The cranberries were a zany idea, but they took away more than they added to the soup in smoothness and flavor. We moved on to the entrees next. 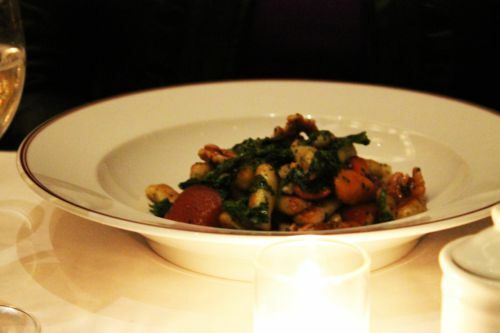 Angela had the sautéed gnocchi with vegetables and a brown butter sauce. She was happy with it. I had a bite or two and thought the flavor lovely, but I like a little more zing in my food than brown butter supplies. Ben’s choice was a lamb dish that I failed to get the description of. 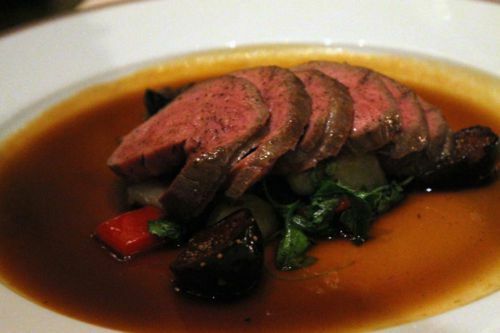 The rare lamb was served over figs and, I believe, spinach. Ben enjoyed it, but he prefers lamb in Indian dishes. 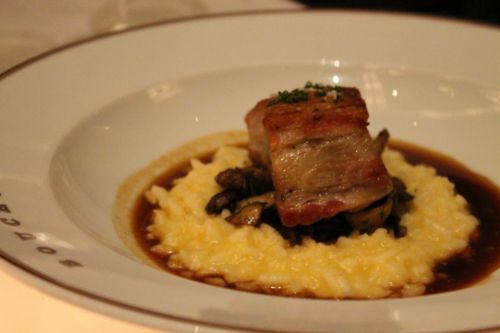 Donna’s selection was the poitrine de dorc, which is crispy pork belly with a butternut squash and forest mushroom risotto. I didn’t try that one, being rather sick of pork belly on menus these days (yes, I’m sick of a lot of popular menu items lately, waah, waah, poor me), but I loved the colorful rings. Donna was pleased. 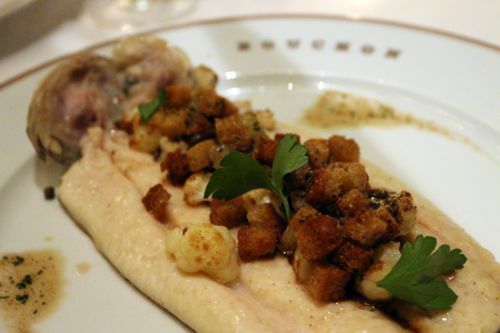 I was beyond pleased with my choice, the truite grenobloise, which is pan-roasted Idaho trout, cauliflower, capers, lemon confit, brioche croutons, and brown butter. I know, I know, I already maligned brown butter in Angela’s dish, but here, it was perfect. The whole dish was perfect, in all honesty. I was amazed with how well each element went together, both in flavor and texture. The brioche croutons were the stars of each bite, giving a buttery crunch that contrasted wonderfully with the succulent trout. I’ve never had trout prepared that well before. Highly, highly recommended. Also highly recommended is the dessert that all three of us girls opted for, the passion fruit pots de crème with a coconut glaze and vanilla shortbread cookies. It looks simple, and it was simple. Rich, subtle passion fruit was the prime element, and it was accentuated with each bite of the bright and buttery shortbread. 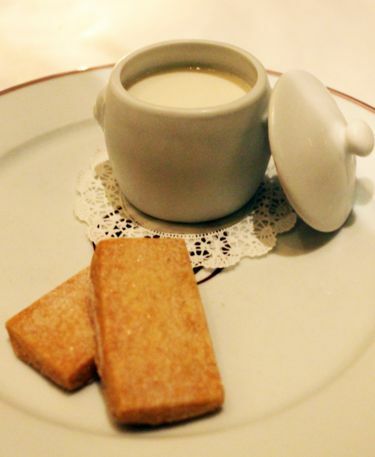 While the trout and pot de crème were the stars of my meal, we did manage to see a few genuine stars as well. Just after we were started, Adam Sandler, in his typical track suit, walked past us, making a little bit of a stir as he stopped to talk with a friend a few tables over. Soon to join him for dinner was another friend, this one dressed in a smart suit and much more petite than I realized from his films—Al Pacino. They took the table right behind Donna and Angela, and we somehow refrained from gaping the whole evening. Hooray for Hollywood! That was certainly a great way to end our time in Los Angeles. We spent the night back at Christa and Joe’s place in Playa del Rey, and the next morning began the Santa Cruz leg of the journey. On the next blog, we’ll hit up Capitola Village—my favorite Santa Cruz area beach—and reunite with more cherished college friends, whom I miss far too much. There are some downsides to having wanderlust, after all, and having my nearest and dearest on the other side of the country is the hugest one of those. Oh, California homesickness, you never truly get better from this coast. If you’d like to peruse more pictures of our trip before the next blog, head on over to our photo site. The bread you speak of above is not braided but sliced and pulled a part. It is called Pan de (di) epi and is suppose to resemble a stalk of wheat. Essentially you form a baguette and then make slices at intervals and pull the bread to one side or the other. Sorry it was hard. Their stand alone bakery in NY and Las Vegas are great. Thanks for letting me know! I would have never guessed it was sliced and pulled to make that shape. I think other people were probably just fine with the hardness of the bread–I just don’t like mine to be that hard to eat, which likely stems from my TMJ. Don’t want to hurt my jaw!